following language wherever it takes you. Petersen's appointment is a two-year term. One of her proposed projects as Poet Laureate is to conduct creative writing workshops for teachers in which "springboards" (words or phrases) are used to help writing flow from the imagination, memories, and experiences. Oregon-born Paulann Petersen published her first poem in 1975, in the Sunday Oregonian. Since then, she has published five full-length poetry collections, including, most recently, The Voluptuary (Lost Horse Press, 2010), Kindle (Mountains and Rivers Press, 2008), A Bride of Narrow Escape (Cloudbank Books, 2005), which Petersen has called her "most autobiographical", and Blood-Silk (Quiet Lion Press, 2004). Her first published collection was The Wild Awake (Confluence Press, 2002; available here). In addition she has issued four chapbooks, including The Hermaprodite Flower (Lewis & Clark College, Watzek Library Special Collections, 2005). Petersen has collaborated with artist-printmaker Barbara Mason to produce a series of 12 original Solarplate intaglio prints, "Bilingual Light", images of which may be seen here. She also has worked with artist Cristina Acosta, who created monotypes and "ghost images" in response to Petersen's poems (information about that collaboration is here). Artist Marilyn Maricle created the illustrations for Petersen's Blood Silk. Drawing deeply on her life in and travels throughout Oregon, Petersen makes nature a primary subject or focus in her poetry. As poet Marianne Klekacz has described her, Petersen "paints landscapes — physical, psychological and spiritual. She offers up the world for us to see as she sees it, full of surprise and wonder and praise". *** Petersen's other themes encompass discovery, attentiveness (especially to the mundane and seemingly unimportant), love and relationships, illness and death, and rural life. Petersen's style is precise, her imagery evocative, her language unfussy and lyrical. She gives us profundity in simplicity. Unhinged and hinged, the bending. Every hand. Its one wild heart. Poems by Petersen have appeared in many literary magazines and journals, including Calyx, CLR Clackamas Literary Review, Notre Dame Review, Poetry, Poetry Northwest, Prairie Schooner, and The New Republic. Her work also has appeared in such anthologies as Contemporary Northwest Poets, From Here We Speak: An Anthology of Oregon Poetry, and Beyond Forgetting: Poetry and Prose About Alzheimer's Disease, as well as within Portland's Tri-met public transportation system as part of Poetry in Motion. 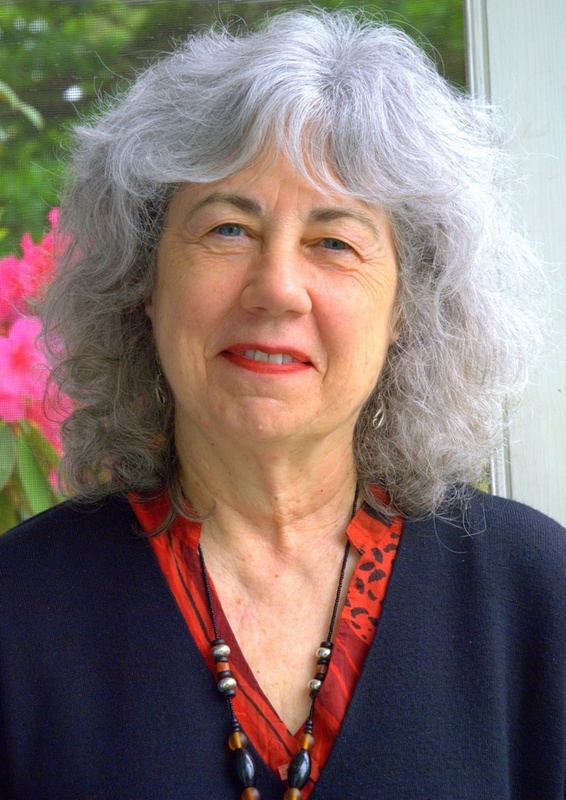 The recipient of a Stanford University Wallace Stegner Fellowship, Petersen also has been honored with the Stewart H. Holbrook Literacy Legacy Award for Outstanding Contributions to Oregon's Literary Life (2006) and two Carolyn Kizer awards in poetry (1989 and 1997). Petersen, who has studied with poets Adrienne Rich and Grace Paley, also has been nominated several times for a Pushcart Prize and in 2006 was a finalist for an Oregon Book Award in poetry (for A Bride of Narrow Escape). A member of the board of the Friends of William Stafford (she knew Stafford personally and credits him with influencing how she lives her life), Petersen conducts many, many high school and college/university workshops, participates in in-teaching sessions for writers' organizations, judges poetry contests, and gives scores of poetry readings around Oregon, in other states, and abroad. She also collaborates on performances of her poems; see, for example, the video "Flash Choir Sings Paulann Petersen's 'Thirst'". ** Quoted in Chris Faatz Interview with Paulann Petersen, Powell's Books, April 20, 2007 (In this interview, Petersen also speaks of influences on her poetry, and life, her experience being published by small presses, and her love of Turkish poet Nazim Hikmet. Petersen's Blood Silk is her "love song" to Turkey, a country to which she has traveled a number of times.) Note: At least three of Petersen's books are available through Powell's. Following are Parts 1 and 2 of the Talking Through Us documentary with Paulann Petersen. In each she reads her poetry. The documentary was produced in December 2010.
spellings and leads going nowhere. I wrote this poem for the One Shoot Sunday Picture Prompt Challenge at One Stop Poetry, where you'll find the second of a two-part interview with photographer JackAZ Photography whose image appears above. Anyone may participate in the challenge. Go here for instructions and for a list of contributors' poems. I can't say I've never heard of it but I will tell you I did not expect to receive it, this plaque with the very happy bear jumping gleefully amid a shower of colorful confetti. 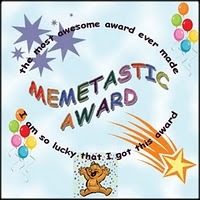 But who doesn't like stars, balloons, and what is clearly "the most awesome award ever made"?! It's Memetastic! My thanks to Kelli Russell Agodon, who, delightful poet that she is, quickly passed the plaque this morning, just as the rules require. To those of you listed above: You may turn down this award and there will be no hard feelings but we all know all of you new awardees are going to keep the award show going, don't we? ✹ After graduating from college, the first place I lived, for six months, was Paris. ✹ I was one of the few students my Italian professor dated. ✹ I occupied the same dorm room Jane Fonda lived in when she attended my college. ✹ My mother's ob was more interested in attending a party the night I was due than tending to my mother. ✹ I never got to give flowers to any star during any of the many summers I worked at Wolf Trap Farm Park for the Performing Arts. Have fun, and happy blog reading this Sunday! to think for herself, will find the truth. Also see this comprehensive site on Nisargadatta. Today's edition of Saturday Sharing takes you to the National Archives of two nations, tells you how to gain access to primary source documents related to scientific discoveries in the field of natural history, uncovers a museum in Portland, Oregon, dedicated to preserving metal type, introduces you to a still-new online magazine Nowhere, and features a nonprofit's creative efforts to put contemporary art in healthcare facilities to promote healing and inspire hope. ✭ The Smithsonian National Museum of Natural History has unveiled a Field Book Project, a joint venture with Smithsonian Institution Archives. The intent of the project is to establish a single online location for information about field books — original or primary source documents describing events and circumstances leading to the collection and description of biological specimens — and other field research materials important to scholars. Important as sources of information about scientific discoveries, the project's collections may include field journals, correspondence, sketches, notes, and other generally unpublished documents. An interesting post at The Bigger Picture, a visual archives blog, offers a look behind the scenes. ✭ The National Archives of the United Kingdom recently made available for viewing a significant collection of images spanning more than 100 years of African history. Those images, culled from a broader photographic collection of Foreign and Commonwealth Office images, are available at Africa Through a Lens. On the same site are several podcasts, including one about the Africa images. ✭ Our own National Archives has launched an "Inside the Vaults" series of video shorts to highlight new finds, report on complex technical subjects in lay terms, and, more generally, to give the public access to its collections, stories, and accomplishments. The film series is free to view and is distributed via a YouTube channel. Here's one of the most recent peeks inside the document preservation and conservation laboratory. ✭ Back in the days, we sent out our news and feature stories to be hand-set in type. Well, we all know how much things have changed but, I'm delighted to report, it's still possible to see how a foundry works. C.C. Stern Type Foundry of Portland, Oregon, is a working museum dedicated, as its tagline reads, to "preserving the art and industry of the cast letterform". With one of the largest collections of Monotype casting matrices in the United States, the foundry makes metal type and decorative print elements and collaborates with a broad array of designers, letterpress printers, and book artists in the Pacific Northwest. Go here to read about the foundry's Typecasting Heritage Project and other initiatives, including its Kickstarter project, Adventures with Orphan Annie & Hot Metal Type (be sure to view the interesting video about the foundry's restoration efforts). ✭ The online Nowhere magazine describes itself as "a place between places, an imagined depot for stories from the road". Its current (third) issue touches down in India and Turkey, among other locales. In the Archives you'll find issues One and Two, both of which show just how far the writers are willing to go to collect and share their "found experiences" and art. You'll find some good reads here. ✭ A nonprofit organization, RxArt seeks to place original fine art in patient, procedure, and examination rooms of healthcare facilities to promote healing, inspire hope, and encourage artistic awareness and expression. Founded by former gallerist, art dealer, and consultant Diane Brown, RxArt is based in New York City. The RxArt collection includes work by such well-known artists as Frank Stella, William Wegman, Sol LeWitt, April Gornik, Louise Nevelson, and Fred Tomaselli. Information about RxArt installations is here. The organization also publishes a coloring book, Between the Lines, for children in partnering healthcare facilities. ✭ Morton Fine Art, in Washington, D.C., is presenting through March 9 "Death of the Fine Art Print", a solo exhibition of work by much-admired wood engraver/printmaker Rosemary Feit Covey, who lives in Alexandria, Virginia, and maintains a studio at Torpedo Factory Art Center. Go here to view images. New work by the internationally exhibited artist may be seen here. ✭ Last week, the Virginia Museum of Fine Arts in Richmond opened its 75th anniversary exhibition "Picasso: Masterpieces from the Musee National Picasso, Paris". The museum is the only venue on the East Coast where the show may be seen during its seven-city international tour. On view at VMFA until May 15, the exhibition requires tickets. (A number of events related to the exhibition already are sold out. Information about ticket requirements is here.) The exhibition earlier appeared at the Seattle Art Museum. Described by VMFA's director Alex Nyerges as an "extremely rare" opportunity to view paintings, drawings, works on paper, and sculpture from every major period of Picasso's artistic career, the exhibition, which has been drawing considerable attention both within and outside Virginia, includes 176 works from Picasso's personal collection. The huge survey was made possible because the Musee National Picasso, deemed to hold the largest and most significant of Picasso's work, is being renovated. To view a selection of images of work in the retrospective, including the paintings Portrait of Dora Maar (1937) and Jacqueline with Crossed Hands (1954), and the sculpture The Goat (1950), go here. Note: There is a marvelous interactive poster for the show on the VMFA's FaceBook page. Clicking on the poster image brings up a set of images showcasing Picasso's Blue, Rose, and African periods, Cubism, Classicism/Surrealism, War Years, and Late Works. ✭ In New York City, the Museum of Modern Art has mounted "Picasso: Guitars 1912-1914", on view until June 6. Sixty-five works drawn from public and private collections, including collages, sketches, paintings, sculptures or "constructions", and Picasso's own small-format photographs, are in the exhibit. Images of featured works are here. An 18-page pdf of all the works may be accessed here. 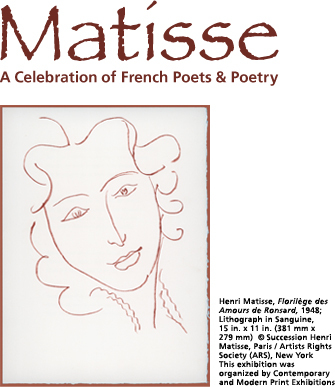 A separate site for the exhibition, which includes commentary and information about Picasso's studio and techniques and materials, is here. Several videos related to the construction, history, and conservation of Picasso's 3D Guitar are available here. Another dealing with Picasso's collages or "papery procedures" may be viewed here. Information about Matisse's work as an artist's book illustrator, publisher Albert Skira, and the books for which Matisse created art is here. ✭ Site Santa Fe is featuring Amy Cutler's new paintings on paper, which are described as depicting "unusual worlds predominantly inhabited by women", and a selection of older paintings from public and private collections. The press release for the solo exhibition is here; it includes information about two other solo shows at Site Santa Fe of porcelain sculptures by Ruth Claxton and film-based installations by Runa Islam. All three exhibitions remain on view until May 15. ✭ Five children's books re-imagined as experiential, life-size sets and scale models are part of the London Imperial War Museum's recently opened exhibition"Once Upon a Wartime: Classic War Stories for Children". The books, chosen for their themes of loyalty, separation, survival, and identity, include Michael Morpurgo's War Horse, Bernard Ashley's Little Soldier, Nina Bawden's Carrie's War, Robert Westall's The Machine Gunners, and Ian Serraillier's The Silver Sword. (All of the books are available in the museum's shop.) Included in the exhibit are objects, photographs, and films that help explain the authors' inspiration and provide historical context. The show, for which tickets are required, runs through October 30, 2011. It reopens in the museum's North location in Manchester in February 2012. In conjunction with the show, the museum is sponsoring an online book reviews competition for children ages 7 to 10 and 11 to 14. Details, including prizes, are here. Photos related to the exhibition are here. Learning-related activities are noted here. The video below provides background on the exhibit. The narrator is exhibitions researcher Hazel Brown. Other videos related to the show are found here. I first had the privilege of seeing in one place a substantial number of paintings by the Dublin-born Sean Scully in 2005 at The Phillips Collection, which presented the marvelous "Wall of Light" exhibition. Oil on Canvas, 90-1/4" x 114-1/2"
I was moved to recall my experience of the work in that Phillips show after watching recently the video below, produced by Laurence Topham, who works for The Guardian in the United Kingdom. In the film, Scully, now living in the countryside in southern Germany and with an exhibition currently at the Wilheim-Hack Museum in Ludwigshafen am Rhein, speaks articulately about his latest work, which he says has been influenced by "the color of the sky, and the color of the trees, and the land and the mist here has come into my paintings, so they're like grids that receive natural inspiration." While "extremely urban", the paintings, Scully offers, are "softening, they're becoming more metaphysical, . . . and more inspired by natural phenomena". Scully notes that at about age 6 he became interested in being an artist but spent his youth as a "street gang member, a street fighter", which, he explains "squeezed out" the art. Fortunately for him and us, the "sense of art" he was blessed with "washed back in again, like a wave". Of interest in his work, Scully posits that it comes because "I think I've combined intimacy with monumentality. And there's no certainty in my paintings." An artist of wit and uncommon eloquence, Scully remarks, "Something like art is a little bit like the donkey and the carrot. And the artist never reaches the carrot. You never get to Nirvana. It's not possible, because your concept, your ambition, is always greater than what you're able to achieve. You're trying to, in a sense, imitate God, because you're trying to be creative." His greatest creation, Scully says, is his daughter Oisin. Scully goes on to remark that art-making should be "something that is happening all at once"; it's "inhabiting you, and that you are doing, and you have, one way or another, managed to get yourself into that space, and there's an angel on your shoulder. That's how you should make art. If you're plotting art, and trying to make something to get something, you're not in a state of creative innocence. You're not making art. You're doing something else." Hesistent to state that he has any particular "destination" in mind, Scully concludes that he's "on a journey" but "doesn't expect to arrive"; quite simply, he says, he'll paint until he can paint no more. Sean Scully: 'You never get to nirvana' from Laurence Topham on Vimeo. 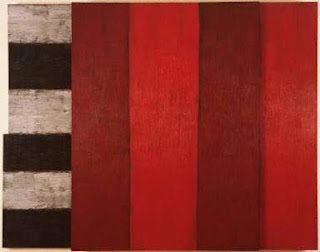 The Phillips Collection, among the first museums in the United States to acquire Scully's work, owns the paintings Niels (2001), Red and Red (1986), Horizontals: Grey Diptych #1 (1977), and Overlay 1 (1973); the pastel on paper Untitled (1996); and the etching Day (2006). Scully's work also is found in the collection of the Smithsonian American Art Museum. A biographical sketch, list of works in the SAAM collection, articles, a Webcast of a lecture by Scully, and a podcast about the artist's prints may be found here. An excellent interview with Scully, conducted by R. Eric Davis and published in the Journal of Contemporary Art, is here. Also see: "Sean Scully: Body of Light", National Gallery of Australia (59 images); "Sean Scully Examines His Evolution as an Artist", Big Think (video and text). Recently, my husband shared with me an article* about an unusual — and deeply thought-provoking — project: "Visceral: The Living Art Experiment". The article's inclusion of a link to the project site was, of course, an invitation to me to look, and I'm so pleased I did. What I found is one of the most engaging art-and-science initiatives I've seen since my friend, artist Rebecca Kamen, mounted her "Divining Nature", a homage to the Periodic Table. 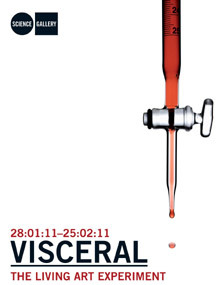 Curated by Oron Catts, co-founder and director of research laboratory SymbioticA Biological Arts, and Dr. Ionat Zurr, artist, curator, and researcher, the "experiment" involves the creation of artworks from living tissue, a challenge for both the fine artists and biotechnologists who collaborated to bring this aptly titled project to fruition. Representing 10 years of work, its highlight is an exhibition at Science Gallery, Trinity College Dublin, ending this Friday with the gallery's "first ever funeral" during which the curators will "turn off" the "alive" biological art (for a number of safety and health reasons the artworks cannot be taken home by the artists). The video immediately below gives an overview of "Visceral" and the hard-to-answer questions it asks of those who view it. I've watched almost of all of the online video interviews with the artists or scientists exhibiting at Science Gallery. Below are two that I found to be particularly fascinating. "Cryobooks Archives", explained here by artist Tagny Duff of Canada, is an installation of hand-made books crafted of human and pig ex-plant tissue, HaCat cells, and a synthetic biological virus. The artist used traditional techniques to bind her books. The work takes its name from the portable freezer that Duff uses as a mobile miniature library. One of the more haunting pieces I viewed online, the "Semi-Living Worry Dolls", tissue sculptures engineered by Catts and Zurr, are inspired by Guatemalan worry dolls that children receive to whisper away their concerns at bedtime and wake up problem-free. The exhibit's hand-made "dolls" consist of degradable polymers and surgical sutures and were seeded with living cells that have, over their time in the exhibition, replaced the polymers, in effect becoming "alive". Visitors to Science Gallery may interact with the dolls by whispering their own worries into the dolls' digital "ears". * The article requires a subscription to access, so I cannot share a link to it. Catts and Zurr began their "Tissue Culture and Art Project" in 1996. It is an ongoing investigation into the use of tissue "technologies" in artistic practice. Visceral on NPR (This features an interview with artist Kathy High's about her exhibit "Blood Wars", as well as a video in which High explains her production process.) Visit this page to find additional articles and broadcasts about the project and exhibits. one word out of you. Hey! I come in colors, too. sharp, neat; really, I do! glow red-hot under the collar. leave me alone in the dark. leaving the overhead light on? I offer this little take on the clothes hanger for the "One Shot Wednesday" event at One Stop Poetry, which each week invites poets to share and read each other's work. be sure to visit the site late Tuesday afternoon and every Wednesday for links to the many contributors' poems.
. . . I think the United States is a perfect country for a poet. . . .
Minnesota's current Poet Laureate is Robert Bly, who began his term at the close of February 2008. Bly is the first poet officially to occupy the honorary position in Minnesota. Two unofficial predecessors were Laurene Tibbetts-Larson (1974 - 1999) and Margaret Ball Dickson (1934 - 1963). The history of the position in Minnesota is somewhat unusual. Dickson was named by the Poet Laureate League of Washington, D.C., and subsequently acknowledged as Poet Laureate in a congratulatory letter from the governor at the time. Tibbetts-Larson claimed the position via a Minneapolis Star reader election resulting in "appointment" by newspaper columnist Abe Altrowitz; the story is that she was then designated "Minnesota Commissioner of Poetry" by the governor. It was not until 1974 that legislation was introduced to make the position official; however, that effort and another in 2004 were unsuccessful. A third bill, in 2005, finally reached the governor but was vetoed. Ultimately, in 2007, the same governor, Tim Pawlenty, relented, acceding to the legislature's expressed desire for a state poet, and signed legislation into state law (Minnesota Session Laws, Chapter 148, Article 2, Section 4). Under the law, the Minnesota Humanities Commission has the responsibility to solicit nominations for the position and make recommendations to the governor, who then makes the appointment and "conduct[s] appropriate ceremonies to honor" the choice. The appointee serves until the governor appoints someone else. The law's only other provision is to encourage state agencies to use the Poet Laureate's services "for appropriate ceremonies and celebrations." The nonprofit Minnesota Humanities Center helps the Poet Laureate to promote awareness and enjoyment of poetry, which may include presiding over poetry contests or writing poems for important state occasions. Now in his eighties, Bly keeps a fairly active schedule, participating in visiting poet series and giving poetry readings, lectures, and workshops in Minnesota and elsewhere. and political poetry, aims toward the world of the soul. So the best poetry is always religious. . . .
A native of Minnesota, Robert Bly is a poet, editor, translator, essayist, and story-teller, the designated "father" of the "expressive men's movement", and a social and political activist (with David Ray, he co-founded in 1966 American Writers Against the Vietnam War). Reknowned as the author of the enormously successful Iron John: A Book About Men (Da Capo Press, 2004), Bly has published more than 30 poetry collections alone, including, most recently, Reaching Out to the World: New & Selected Prose Poems (White Pine Press, 2009); My Sentence Was a Thousand Years of Joy (HarperCollins, 2005; Harper Perennial, 2006) and The Night Abraham Called to the Stars (HarperCollins, 2001; Harper Perennial, 2002), both books of ghazals (love poems); and The Insanity of Empire: A Book of Poems Against the Iraq War (Ally Press, 2004), which includes a famous poem "Call and Answer", published in The Nation in 2002 (see video below). A new collection, Talking into the Ear of a Donkey, will be published in May by W.W. Norton; it will include poems ghazels as well as poems in free verse. Among Bly's earlier volumes of poetry are Morning Poems (HarperCollins, 1997; Harper Perennial, 1998), Eating the Honey of Words: New and Selected Poems (Harper Flamingo, 1999; Harper Perennial, 2000), What Have I Ever Lost by Dying? Collected Prose Poems (HarperCollins, 1993), Meditations on the Insatiable Soul (HarperCollins), Loving a Woman in Two Worlds (Perennial/Harper, 1985; 1991), and The Light Around the Body (Harper, 1967), which includes poems about the Vietnam War. Bly's first published collection was Silence in the Snowy Fields (Wesleyan University Press, 1962). Poetry anthologies Bly has edited include The Rag and Bone Shop of the Heart (HarperCollins, 1992), The Soul Is Here for Its Own Joy (Ecco Press, 1995), and Best American Poetry 1999 (Scribners). He also is the author of The Darkness Around Us Is Deep: Selected Poems of William Stafford (Harper/Perennial, 1993); Stafford was a mentor. Bly has translated the work of numerous Eastern, European, and South American poets, including Hafez, Kabir, Mirabai, Rainer Maria Rilke, Francis Ponge, Federico Garcia Lorca, Pablo Neruda, Cesar Vallejo, Jiminez, Antonio Machado, Norwegians Olav Hauge and Rolf Jacobsen, and Swedes Harry Martinson, Gunnar Ekeloef, and Tomas Transtromer. His recent translations include Kabir: Ecstatic Poems (Beacon Press, 2007), The Lightning Should Have Fallen on Ghalib (Ecco Press), written with so-in-law Sunil Dutta, and Angels Knocking on the Tavern Door (HarperCollins), a selection of Hafez poems. A more complete list of Bly's poetry collections, translations, essays, and anthologies and edited books is found here. but to develop it in a dark room. . . . In a space so constrained as this, one cannot begin to survey Bly's extraordinary output of poetry, his mastery of the ghazal form and the prose poem, his use of what has been called the "deep image", the sense of unstudied sonority about which so many reviewers comment, his ability to write in more than one distinct voice, the interior but also public/political-social landscapes he mines, the directness of his voice that at the same time can be intimate, even spiritual, in his "object" poems, the depth of his learning and knowledge, how he employs such themes as nature, grief, culture, politics. A first reading of his work often is insufficient to gather a full understanding of his similes, metaphors, allusions, and meanings, or even to appreciate his elegant style. Consequently, the brief excerpts I offer below are simply a few lines that speak to me. ~ From "In the Month of May"
~ From "Living at the End of Time"
Of teak or the owls of Spain. Asked by interviewer Paul Gordon* whether poetry can "save us from the error of our ways", Bly replied, "No. Poetry is a reminder. It's a small thing. But it insists on the important things in life. . . ."
The prolific Bly has published poems in a long list of literary periodicals, including Antioch Review, Chicago Review, Hudson Review, Michigan Quarterly Review, Ohio Review, New Republic, Poetry, Atlantic Monthly, The Paris Review, The Nation, Prairie Schooner, Texas Quarterly, and Virginia Quarterly Review. His honors include a 1968 National Book Award (for The Light Around the Body, 1967), the McKnight Foundation Distinguished Artist Award, Fulbright, Guggenheim, Rockefeller, and National Endowment for the Arts fellowships; and the 2008 Tomas Transtromer award for poetry. 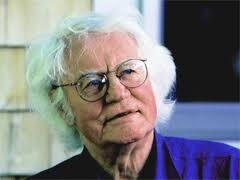 Robert Bly Poems Online (Scores of sites carry Bly's poems; I've listed just a few of them. ): "Call and Answer", "The Night Abraham Called to the Stars", "Dawn", All on Bly's Website; "Two ramages for old masters" [also known as "Silent in the Moonlight"], "Advice from the Geese", "Poem for Andrew Marvell", and "The Greek Ships", All Audio-only at Poets.org; "The Cat in the Kitchen", "Snowbanks North of the House", and "The Buried Train", All at Modern American Poetry; "Listening" and "Dawn" at Blue Flower Arts; "A Dream of Suffocation", "The Indigo Bunting", "In Danger from the Outer World", "Moving Inward at Last", and "It's Hard for Some Men to Finish Sentences", All at Fat Poetry Book; 14 Poems at Wisdom Portal (Also see Bly Poetry Reading and Poetry Colloquium on same site. ); 17 Poems at World Poetry Database; "Waking From Sleep", "Prayer for My Father", and "Driving Toward the Lac Qui Parle River", All at Poetry Out Loud; "People Like Us" at The Writer's Almanac with Garrison Keillor; 4 Poems at Basho's Road; "Stealing Sugar from the Castle" at Great Mother and New Father Conference; "Poem in Three Parts" at Planet of the Blind; "People Like Us" at For the Earth Blog; "The Water Tank" at Grey Sparrow; "Wanting Sumptuous Heavens" at Poem of the Day; "The Parents Poem" at The Paris Review; "The Teeth Mother Naked at Last"; "The Cat in the Kitchen (for Donald Hall)" at Famous Poets and Poems; "In the Month of May" at Reckonings; "There Are So Many Platos" (excerpt) at Oxford Journals Literary Imagination; "Loon's Cry" (video) at OpenVault; "Driving to Town Late to Mail a Letter" at Poetry180; "Nirmala's Music" at The American Poetry Review; "Warning to the Reader" at The Prose Poem: An International Journal. Excerpt, Poems of Rumi by Coleman Barks and Robert Bly, at Better Listen! Below is Bly's "Wanting Sumptuous Heavens" on MotionPoems. It is read by Bly. The animation is by Angella Kassube and the music by Tom Lieberman. to say, take me somewhere. There's a lot going on the digital and literary worlds, as you'll see when you visit the sites highlighted below. If you're looking for a more exciting virtual experience, stop off for an Extreme Planet Makeover. ✭ A new blog, Digital Collaboration, is providing a one-stop location for digital librarians, archivists, museologists, and computer scientists to share resources. Spend a few minutes here and you'll find there's much of interest to explore, from cloud computing forecasts and information visualization to crowdsourcing, to digital preservation of museum and other collections. ✭ Brian Moss, director of worship, music, and arts at Seattle's John Knox Presbyterian Church, is presenting his "experiment in prayer and music" at the Prayer Book Project. His idea is to write and record songs inspired by the Psalms and has set as his goal 15 songs a year for 10 years. His music is available via iTunes and myspace. ✭ Ever get a hankering to escape Earth and create your own planet? Well, now you can at Extreme Planet Makeover. Using the tools at the site, calculate distance from stars, planet size, star type, and planet age and then click the camera icon to download an image of your custom world. The site is the imaginative product of NASA's Jet Propulsion Laboratory at the California Institute of Technology. ✭ PennSound Center for Programs in Contemporary Writing, University of Pennsylvania, has launched in collaboration with Double Change a site for film and audio recordings in Paris. The audio and video recordings of poetry were made between 2006 and 2010. Details about this marvelous resource are here. ✭ The Center for Fiction, the only nonprofit in the United States dedicated to celebrating fiction, has launched an online magazine, The Literarian. Visit to find not only original work by and interviews with such admired writers are Cynthia Ozick but also fiction by emerging writers, as well as a monthly sampling of literary journals from around the world. Submissions from new voices are welcome. Be sure to take a tour of the center's site; it offers a wonderful array of resources. ✭ A new site to be devoted to electronic literature is being developed by the literary journal Prairie Schooner and the Center for Digital Research in the Humanities at the University of Nebraska/Lincoln. 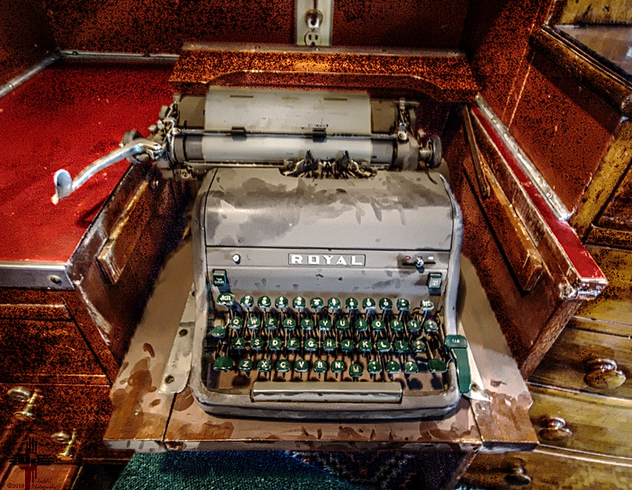 The project, to go live this fall, will feature collaborations between authors and artists, hypertext projects, and literary multi-media artwork. Submissions of digital projects from visual and video artists, programmers, and filmmakers are due by March 15. Queries should be directed to Web editor Timothy Schaffert at tschaffert2@unl.edu. Wednesday Wonder: The Tiniest Periodic Table?